We’d like to bring you in this section various thoughts on prayer from some great saints and theologians in the Catholic Church. Have you ever asked yourself these types of questions: “How do I pray? Why do I pray? Am I doing it right? Is God listening? If not, why not?” Don’t feel embarrassed! And, as Our Lord said in the Gospels, on more than one occasion, “Do not be afraid”! We’ve tried on this website to show our readers that there is no mysterious secret formula for prayer. You can start out with such basic prayers as the Lord’s Prayer, the Hail Mary and the Glory Be. There are also various short prayers you can say at various times, even in the midst of a busy or particularly challenging day. In its essence, prayer is essentially a heartfelt conversation with God, through both vocal prayers (such as the ones we just mentioned, as well as the various other prayers we’ve posted on this site) as well as mental prayer. Mental prayer (defined in part here and discussed here as well), allows us to broaden this conversation and deepen our relationship with God through mediation on Divine truths so we can better discern His will for us and draw closer to Him. Your prayers to God can also consist of your own spontaneous thoughts addressed to Him. Speak to our Lord as you would to a friend or loved one. Share with Him both your joys and sorrows as well. He wants that very much from each of us! 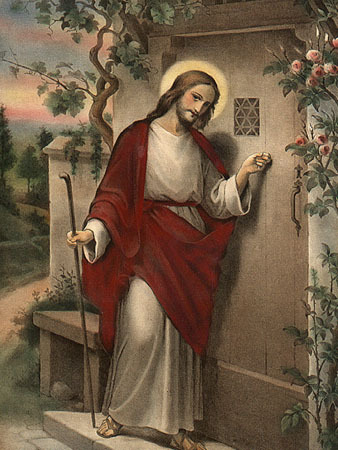 After all, Our Lord is always knocking at the door of our hearts (Rev 3:20; pictured above), but He will not enter without our consent. Another major Doctor of the Church, St. Augustine, also sheds some additional light on the Lord’s Prayer, as well as on the nature of how we are to pray and what we should ask for in this selection from his “Letter to Proba”. He makes this important point, however, that others have noted as well over the centuries: God isn’t Santa Claus! He wishes to gives us what we need, which is not always what we think we need or want. These selections we present here do not make for “easy reading”! But don’t feel intimidated by that. And don’t worry if you can’t follow everything in a selection right away or if you need to read over some of these passages a few times to understand them better. You’ll find it well worth the effort. It might even help you in your meditations! In all things, remember to approach God in prayer with as much sincerity, humility, and perseverance as you can. Even when it seems like He isn’t listening to you, or that your troubles seem to be never ending, hang in there! Trust that our Lord will see you through tough times, as described here, and that He always wishes to strengthen you spiritually, so that you may advance in Holiness. Persevere in seeking God’s guidance in all things and allow his graces to help you get through those times when you are most troubled. And in those dark hours, offer up your sufferings to Christ on the Cross. They can do a world of good for yourself or others!